In the year 1211, St. Francis and a few of his followers built the first nine cells of the now Franciscan Hermitage, and it has been called Le Celle ever since. Originally, only a few small hermit’s cottages and peasant dwellings existed, including a small chapel built during the Lombard invasions and dedicated to the Archangel Michael. This is believed to be the place where, in May 1226, four months before his death, St. Francis dictated his Will. Following the death of Saint Francis that same year, Brother Elias of Cortona who was among the first to join St. Francis of Assisi in his newly founded Order of Friars Minor, withdrew permanently to the Le Celle Hermitage. In 1239, Elias carried out a number of improvements and restoration works which ensured the hermitage became a permanent Franciscan property. 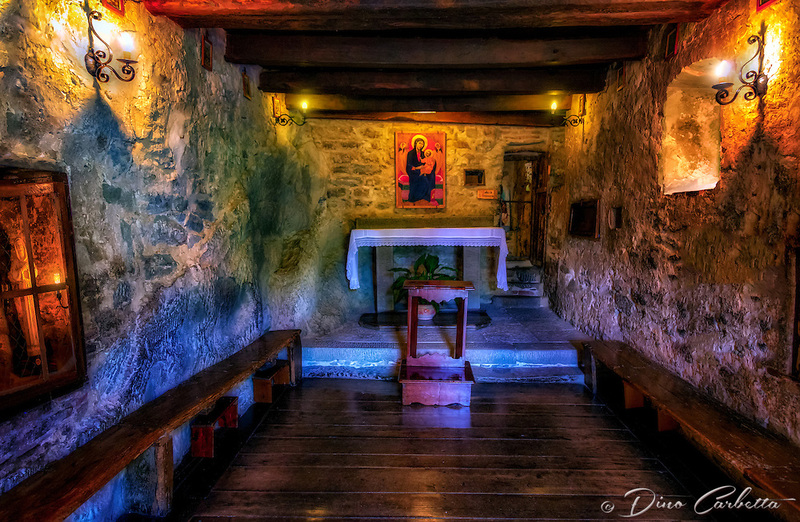 Brother Elias is in fact considered responsible for having broken up the stone of the caves and created a chapel that was formerly used as a dormitory by the monks, and the small cell where St. Francis lived. I found Le Celle to be one of the pleasant surprises in and around Cortona. The tiny cells built into the side of the mountain with a stream descending along the structural edge, creates a surreal and picturesque vision of Saint Francis’ image of God and nature. Imagine the spiritual solitude as Saint Francis would take hermitage here for days of ecstatic meditation with only a loaf of bread, listening to his beloved waterfall beneath a small window. This image is of the tiny chapel built into the rock of the cliffside. Notice the statue of Saint Francis in the window quietly observing the Mass.